A hundred years ago, we ate what was local and easily grown in our county. Today we have Whole Foods, Trader Joe’s, 7/11, and McDonald’s, who serve us food from around the world all year long. But it's a mixed blessing, this access and abundance, and it's easy to look around and not actually be so happy with our luck; to long for a time when chickens were given names and ran underfoot, playing with toddlers on the floor of the kitchen before being swept up by a firm hand to be killed and eaten. 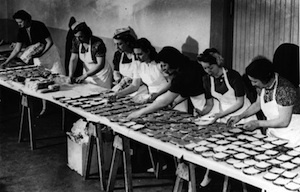 While the popular face of this nostalgia frames itself in terms of health and well-being — a return to slow food keeps us far from chemicals, preservatives, and other not-so-good stuff — I'm convinced these wistful thoughts really crop up because this pervasive, pre-Bronze-age desire to get our hands dirty in soil cannot be satisfied by the picture of a cornfield on the back of a box of cereal alone. However you look at our reaction to the increasingly corporate way in which we get our food, it's a ripe topic for exploration — and seems to particularly lend itself to the sort of single-topic book that's defined gastronomic nonfiction for the past few years. Each of three recent titles — Fresh by Susanne Friedberg (buy on Amazon ), Deeply Rooted by Lisa M. Hamilton (buy on Amazon ), and Coop by Michael Perry (buy on Amazon ) — takes on the issue by addressing the idea of the middleman, whether it's cutting him out or cutting him down to size. The most academic of the three, Friedberg's Fresh: A Perishable History deals with the literal meaning of the word. Once upon a time, “fresh” meant picked (or slaughtered) by Pa this morning. Today, we apply the term to anything without mold on it — which, thanks to contemporary preservation and refrigeration, means the food could have been picked, slaughtered, or preserved days (or weeks, or even years) ago. Based on the evolving definition of the term, Friedberg glosses the entire history of American gluttony, with a focus specifically on the transition to and public acceptance of refrigeration. Although at times falling into a dry and textbook-esque voice (Friedberg is a professor of geology at Dartmouth College, and apparently the pedantic tone is hard to cast off), the smart prose and comprehensive approach work, shedding light on "fresh" as a manipulator of public desire. Particularly engaging is Friedberg's account of how early twentieth-century captains of industry took advantage of America’s fear of the filthy stockyards so grotesquely exposed by Upton Sinclair in The Jungle, employing (and promoting) newfangled refrigeration devices in pursuit of "freshness." Hamilton’s Deeply Rooted: Unconventional Farmers in the Age of Agribusiness take a journalistic approach, profiling three independent, family-run working farms in the United States: a radical milk farm in East Texas, a tenth-generation ranch in New Mexico, and an at times chillingly future-oriented seed farm up in North Dakota. 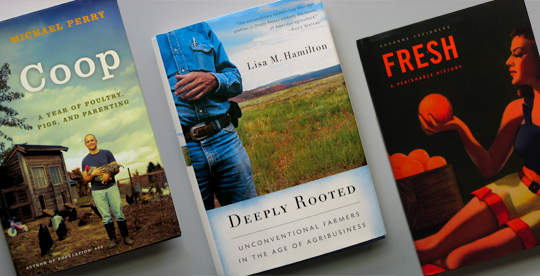 While each farm has a wildly different story to tell, Hamilton weaves together their daily routines, philosophies, religious views, and above all, their work ethics, into a broader picture that knocks the legs out from under the cliche of the plight of the American farmer. While this is mostly a book that offers a vicarious peek into the lives of those who have the guts (or, at times, delusional confidence) to stand up for their right to toil the land without being bought-out or bullied, Hamilton also delivers a clear argument for reimagining profit-driven big business and mitigating its destructive impact on the livelihood of the modern-day farmer. Reaching for the same philosophical brass ring as Deeply Rooted is Michael Perry's Coop, though it operates on a much more intimate scale. Driven by a desire to make something "of himself, by himself," Perry and his wife dropped everything and pulled the ultimate yuppie-escape-fantasy move: they hauled out to his mother-in-law’s old farm in Northern Wisconsin. This City Slickers-esque move provides plenty of material: Perry’s thoughtfully composed memoir of his first year on the farm is a clear-eyed look at what happens when a modern family quits their urban world for the rural one. They spit in the dirt, they blow their noses without tissues (a “farmer snort,” as Perry calls it), they raise chickens, and most of all they are flung headfirst into self-sufficiency. Perry spends a fair bit of time basking in the righteous glow of self-sufficiency and his newfound sense of Being A Man, but I'll begrudge it to him: from a starting point of zero, he wound up providing for his family in a caring, direct way that no Wal-Mart ever could, no matter the size of the grin on its Greeter. Perry’s book is, perhaps, the most enjoyable of the bunch – his fears and hopes as a modern father, his frequent relapses into memories of growing up on a farm and his own father combine to make a moving, delightful read. But take the three together — or add in any other of the dozens of books that have been published in the last year that engage in the same exposes, and make this same case for a return to more natural roots — and it paints a clear picture of a desire for change. Now we just sit back and wait for the glut of books that'll promise to show us how to get where these books want us to go.